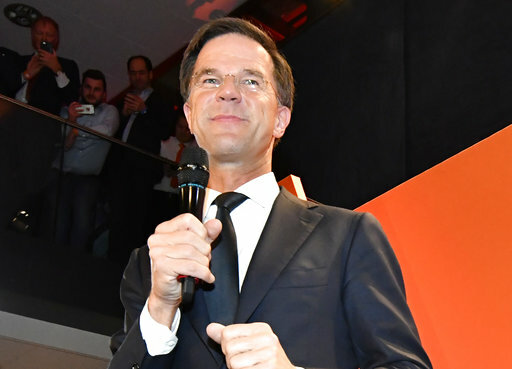 THE HAGUE, Netherlands (AP) — Dutch Prime Minister Mark Rutte on Wednesday claimed a dominating parliamentary election victory over anti-Islam lawmaker Geert Wilders, who failed the year’s first litmus test for populism in Europe. The Netherlands’ main exit poll suggested Rutte’s party won 31 seats in the 150-member legislature, 12 more than Wilders’ party, which shared second place with two other parties. Following Britain’s vote to leave the European Union and Donald Trump’s election as U.S. president, “the Netherlands said, ‘Whoa! Stop!’ to the wrong kind of populism,” said Rutte, who is now poised for a third term as prime minister. “We want to stick to the course we have — safe and stable and prosperous,” he added. Wilders had insisted that whatever the result of the election, the kind of populist politics he and others in Europe represent aren’t going away. “Rutte has not seen the back of me! !” Wilders said in a Twitter message after the exit poll results had sunk in. The fight erupted over the Netherlands’ refusal to let two Turkish government ministers address rallies in Rotterdam about a referendum that could give Turkey’s President Recep Tayyip Erdogan more powers. It gave Rutte an opportunity to refuse to bow to foreign pressure, a stance with widespread backing in the nation. In a subplot of the elections, the Ipsos exit poll had the Green Left party registering a historic victory, turning it into the largest party on the left wing of Dutch politics for the first time. The Greens leapt from four seats to 16 in parliament after a strong campaign by charismatic leader Jesse Klaver, who invites comparisons to Canadian Prime Minister Justin Trudeau, according to the exit poll. “This is a fantastic result for us, a historic victory,” Green Left chairwoman Marjolein Meijer said. The chance of Wilders becoming prime minister in the Netherlands, where a proportional representation voting system all but guarantees coalition governments, was remote, even if his party had placed first in the election. Wilders’ one-page election manifesto included pledges to close borders to immigrants from Muslim nations, shutter mosques and ban the Quran, as well as to take the Netherlands out of the European Union. Rutte has driven through unpopular austerity measures over the last four years, but the Dutch economic recovery has gathered pace and unemployment has fallen fast. The main exit poll showed Rutte controlling 31 seats, 10 fewer than his party won in the 2012 elections. Three parties each won 19 — the pro-EU center party D66, the Christian Democrat CDA and Wilders’ Party for Freedom. Rutte has been resolute about not wanting to rule with Wilders, so that tightens the market in which he can acquire the necessary 75-seat threshold.